While the Long Island Live Steamers may be called the best kept secret on Long Island, there’s another little secret we’re about to divulge. Riding a scale model train around and around just isn’t as much fun when you do it alone. Seeing a small child, or a 40 something inner child smiling and laughing makes all the work so much more worth while. 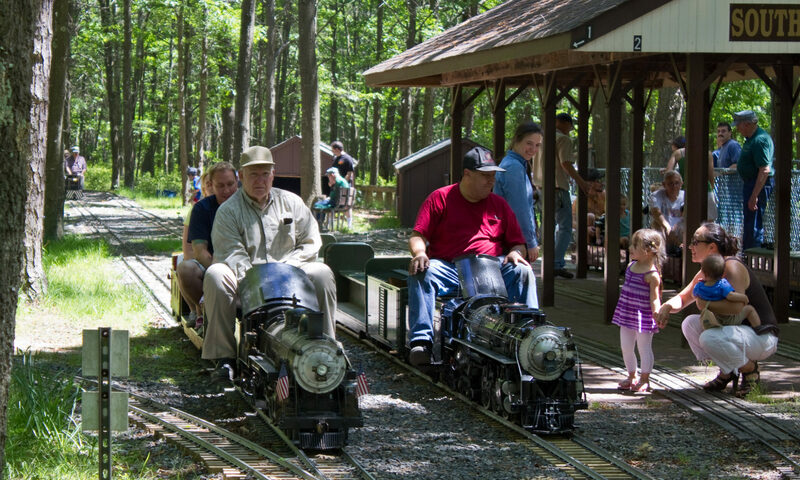 We LOVE showing off our trains and we invite you to join us on our Public Run Days. To ride the HIGHLINE TRAINS children must be at least 40″ TALL. LILS is located in Southaven County Park in eastern Long Island, NY. Our facilities include a souvenir shop, and snack bar, as well as shaded picnic areas with the best views of our operations areas and steaming bays. Visitors can arrive as early as 9:30 and watch our steamers “Steaming up,” building their fires and the steam pressure needed to operate. It takes about an hour or so, and this is the perfect time to ask the builder/engineer/fireman the many questions that come to mind about that mystical era of steam power. But please be certain to REMAIN BEHIND THE FENCES in these and all other areas. From the steaming bays, you can wander over near our diesel roundhouse to watch the “growlers,” a steamer’s mildly disparaging term for diesel locomotives, being brought out to build their consist (the term for the assembled train of engine and cars) for the days run. At this point you are just across from the ticket booth, so stop in early and get your tickets for the day’s rides. While there is no “charge” for rides, you must have a ticket to ride, and at the ticket booth, you have an opportunity to make a generous donation to support our railroad. From the ticket booth passengers move to either the highline or groundline (the tickets and stations are different so you decide at the ticket booth) to wait for the next available train. Your train will depart from one of four tracks on the ground line, (we run as many as eight or more trains simultaneously). Leaving South Haven Station you will loop the main line twice, negotiating switches, crossovers and a portion of the 8.5 acres of shaded Suffolk County Parkland detraining at Jamaica Station. You will see our signals change as your train enters sections, possibly with another “local” waiting for your “express” to pass. If you choose the highline you will enjoy an even more rural ride through the natural park land, all the while wondering how that impossibly small engine can pull your full trainload of children and adults. Our operating schedule can be found in the Events section and Directions to the club are just a click away as well. We offer trackside picnic tables so your family can watch the trains while you enjoy your lunch. Southaven Park offers many other activities to round out your day. Don’t forget to visit our Picture Gallery and pages detailing our Club Engines as well as our Members’ Engines. We hope you enjoy your on-line visit and hope to see you at the track soon!